Last Friday, my Hints weblog was all about creating time-lapse movies in iMovie. In preparing that hint, however, I had some difficulties. When I tested the hint on my Dual G5 Power Mac, I had a minimal set of options in the Time Lapse dialog—basically, just the ability to specify the number of frames to skip. When I tested it on my MacBook, however, I had more options—specifically, the ability to embed the date and time into the captured frames. The ability to embed the date and time is a most-usable feature in a time-lapse film, especially if you’re recording action over multiple days. So I really wanted to figure out why the MacBook could do it, but the G5 couldn’t. 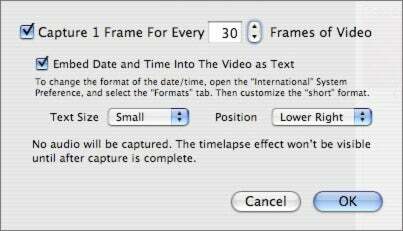 At first, I thought it was an Intel versus PowerPC issue, but then a friend with a PowerPC machine tested iMovie for me, and he discovered that he also had the expanded time-lapse dialog. Now I was really confused. I resorted to comparing the preferences file for iMovie between the two machines, and found no substantive differences. Stumped, I went ahead and wrote up the hint for Friday, carefully avoiding the issue of the different dialog boxes. Later in the day, I went back to the G5 to do some more digging. The first thing I decided to do was to make sure time-lapse mode worked. So I recorded a short clip on the G5, and successfully played it back. So I knew I didn’t have a larger issue with time-lapse mode; I just had some missing options. I then thought I’d try a slightly longer test recording with a different capture rate, so I again activated the time-lapse drop-down settings dialog. I was very surprised to find that the G5 now had the exact same time-embedding options as those of the MacBook! What’s the trick? It seems that my G5 had never been used to record a time lapse movie before. The simple act of recording one somehow enabled the time-embedding options on the next activation of the settings dialog! Very strange. To confirm this, I launched iMovie on the Mac mini Core Duo, which I’ve never used for any iMovie editing. A quick test confirmed that the simple time-lapse dialog was replaced with the advanced version as soon as I recorded even a five-second snippet of time-lapse video. I assume this is a bug in iMovie, and I’ve submitted it as such (bug #4659957, though submitted bug reports aren’t publicly viewable). But until it’s fixed, and to save others the head scratching I went through, just record a short time lapse video to enable all of the options in the Time Lapse dialog box.